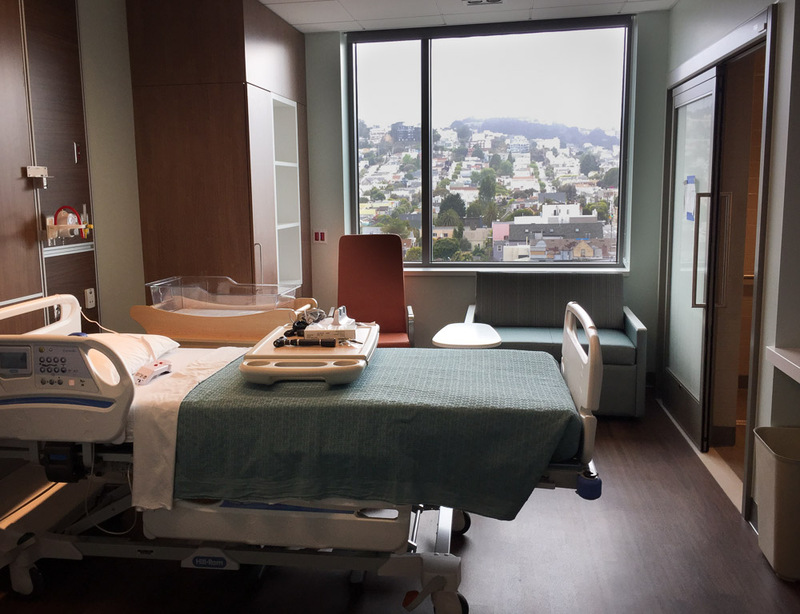 Labor and delivery room at the new Mission Bernal Campus - check out the views! I’ll focus on the nuts and bolts of the new labor and delivery unit, which I toured along with a group of doulas and midwives before it opened. Hannah Epstein, the lead midwife for the St Luke's Women Center, organized and led the tour. She says the new building won’t change the care - it’s just moving to a lovelier environment. In addition to looking nicer for patients, she emphasizes that the majority of the improvements are meant to streamline operations for the providers. Instead of wires literally underfoot in the operating and delivery rooms, cords run from the ceiling and the medical equipment is organized for a smoother workflow. It’s also substantially more secure, with locking doors that patients and families will have to get buzzed into. But Hannah says that if your baby is coming very fast it’s okay to go straight through the doors and trigger the alarm - that will alert the staff to attend to you right away! The new unit is twice of the size of the old, with 6 labor and delivery rooms, 16 postpartum rooms, and 2 operating rooms. There is also a 4 bed nursery. All of the birth rooms have large tubs for laboring in (not birthing, I’m assuming) and nitrous oxide for pain relief. They also have sleeper sofas which are slightly bigger and more comfy than the old. All the rooms had big windows and great views. There are 4 triage rooms, which will do double duty as antepartum testing rooms until eventually that function is moved to the Hartzell building. They will also be called on as needed for early inductions. The main entrance to the building on Cesar Chavez will be locked after 7pm, and everyone in labor, regardless of the time, is encouraged to use the ER entrance on 27th St off Guerrero. There will be a pull in spot on the street where you can leave your car, drop your keys with security and go up to Labor and Delivery on the 7th floor. Once the laboring person is settled, someone can come down and move the car into the Duncan garage, which also have two dedicated OB spots closer to the entrance. The heightened security of the new unit comes with a few downsides - only nurses have access to the kitchen for example (where there is a fridge for patient food). Also, if you want to stair-walk in labor, there is no way to get back into the unit after you’ve been badged onto the stairs, so the only option is to walk all the way down to the first floor and take the elevator back up. The new cafeteria will be open from 6:30am - 6:30pm with the same food but in a nicer space. Eventually, the current hospital building will be razed to make way for outdoor garden space and there will be a conference room available to rent. 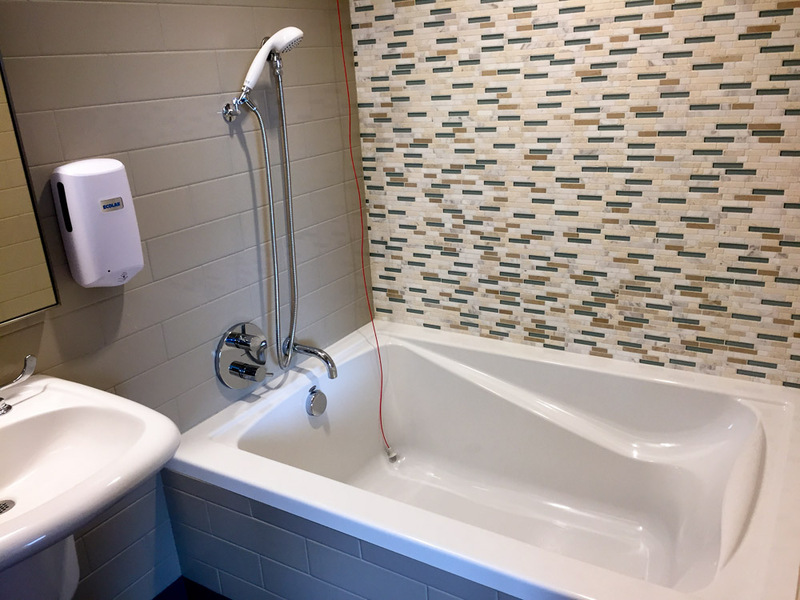 Other amenities include a meditation room open 24/7, a family waiting room and play area outside of the locked unit, and a lactation and breastfeeding room. This is a typical postpartum room - same views, much smaller. The loveseat pulls out to a bed. Although Hannah hopes that the care won’t change, Sutter does want the new unit to increase their volume to 120-150 births per month. There will still be one midwife and one doctor on duty around the clock, just like now. Currently St Luke’s only has one full time lactation consultant, which results in spotty coverage, although Hannah says that she would like to hire more as the volume increases. There is also the possibility that other medical practices will have privileges at the hospital, and that there could be some shared call in the future. That means that St Luke’s Women’s Center patients could potentially end up with a doctor from another practice managing their birth. My colleague Firen Jones already wrote a great blog post on the care and policies at the old unit. Ultimately, those factors are more important than the physical building - but the new space is an upgrade that will definitely feel nicer and positively impact family's birth experience. Although Alta Bates’ long term future is uncertain, it’s still a hub for East Bay maternity care and sees over 600 births a month. That’s down from 700, perhaps due to Kaiser being such a (relatively) attractive plan through Covered California. I recently took a tour of Alta Bates Labor and Delivery. I’ve been there dozens of times as a support person, but I was curious to see it through the eyes of an expectant family. About 12 couples gathered on the first floor in a big room where the tour guide answered questions and walked us through what to do when labor starts. Always call your doctor or midwife first! Every provider may make a different plan with an individual patient, but as a general rule of thumb, Alta Bates encourages first timers to come in when contractions are coming every four to five minutes, lasting a minute, and that pattern has been in place for two hours. This is colloquially known as 4-1-2, and is a change from the old 4-1-1, with the pattern only lasting for one hour. As the tour guide explained, “you are better of staying at home for as long as you can” because “birth is not a medical event” and it’s more comfortable to labor at home. Our guide recommended parking in the garage and walking to labor and delivery (third floor) if labor isn’t too advanced. Once you are through triage and admitted, someone can go back out and exchange the parking slip for a $20 flat rate ticket with which the car can come go for 72 hours. Although our tour guide said that she has “never heard of it being full in 29 years”, I have twice been told when calling to bring in a home or birth center transport that they were too full and we really should go elsewhere. They can’t refuse to see someone in labor but I have seen patients have to wait in triage for a very long time to get a room. When we moved up to the third floor to check out the labor and postpartum rooms, a loud moan from triage sent a thrill through the group of mostly first-timers. Later on we heard a newborn’s cry, equally exciting. They have three telemetry units (portable monitoring so that you can have more freedom to move away from the bed), which doesn’t sound like very many, but most people are on continuous monitoring due to pitocin or epidurals. I’ve never seen anyone not be able to get a telemetry unit who wanted one. They will do intermittent monitoring for low risk pregnancies, which to them means 20 minutes out of every hour on the monitors. I will add that sometimes getting what they consider an adequate strip takes more than 20 minutes. Not so appetizing... but luckily there are many close food options nearby! There are some archaic policies in place. Once admitted, you are not allowed to have solid foods, only liquids. The guide did say that every doctor feels differently and perhaps yours would be willing to override hospital policy, so that is a good question to ask prenatally (keep in mind the whole group of doctors or midwives has to be on board, because you don’t know who you will get in labor). You could be admitted for all sorts of reasons long before active labor (rupture of your membranes, induction) and have to go literally days without eating. You are only allowed to have four support people in the labor room (including a partner) and one support person in triage. I have seen this be a problem many times during home birth transports, when support people can add up fast. The person in labor usually wants their partner with them in addition to the midwife and maybe a student midwife, a doula, and other family members or friends. It’s especially problematic in triage, when a laboring person may have a partner and a doula or midwife, and important decisions and conversations are happening about the management plan and whether to stay in the hospital. In comparison, John Muir allows five support people in the delivery room and two in triage and allows eating in labor. I don’t know what the official Kaiser Oakland, San Leandro, and Walnut Creek policies are but at those facilities I’ve seen at least four support people allowed in triage (where the rooms are private) and at least five in delivery rooms. After about two hours, everyone is moved to a postpartum room, which all have pullout couches for the partner. Alta Bates practices routine rooming-in (meaning your baby doesn’t leave the room except for medical procedures). Most people stay two days after a vaginal birth and three days after a c-section. There is the potential to go home after 24 hours if you ask. Lactation consultants are available every day from 8am-6pm but they can get busy so you may have to ask to be seen. I recommend that all parents breastfeeding for the first time ask for a lactation consultant to come to their room before they go home from the hospital. With the exception of four larger rooms in the middle, all the rooms have windows and are small relative to the labor rooms at John Muir or Kaiser Oakland. Ultimately, room size and shininess has a lot less impact on patient satisfaction and outcomes than the nursing care and provider management of labor and delivery. Unfortunately, those are harder to judge from a one hour tour. Personally, I have had many great experiences at Alta Bates and some that left the family and myself wishing for better care. To some degree, the hospital and provider are the biggest determinants of your mode of birth. No matter how educated or prepared or motivated you are to have a vaginal or natural birth, you are constrained by the policies and approaches of your providers. For hard data on outcomes by hospital we can turn to Calhospitalcompare.org, which offers statistics on four key indicators of quality in maternity care, most importantly, the c-section rate for a population that should be largely low risk: first babies, at term, singletons, and head down. They also look at breastfeeding, episiotomy, and VBAC (vaginal birth after cesarean) rates. In a comparison between Alta Bates, Highland, and John Muir, Highland clearly comes in ahead. If you strongly desire a vaginal birth, and given that Alta Bates has a 19.4 % c-section rate, John Muir’s is 23% and Highland’s is 13.3%, I would choose Highland any day. Likewise on the episiotomies, which Highland reports at less than half the rate (1.3%) of Alta Bates (2.8%) and John Muir (7.2%). Alta Bates and Highland have almost identical VBAC success rates at 33.2 and 33.8%, respectively. John Muir is much lower at 20.8%. Interestingly, Highland’s breastfeeding rate is the worst. There isn’t any information given on the website about how that outcome is measured. Any initiation of breastfeeding? Exclusive breastfeeding at discharge or at six weeks? Unfortunately, in our byzantine insurance system, you may not have much of a choice. I recommend calling your insurance company to find out which hospitals are in-network. If Alta Bates is your only option, rest assured that you are still likely to receive quality care.